Packed with freshly grated apples and a healthy dose of cinnamon, these Apple Cinnamon pancakes will be a win with the whole family. 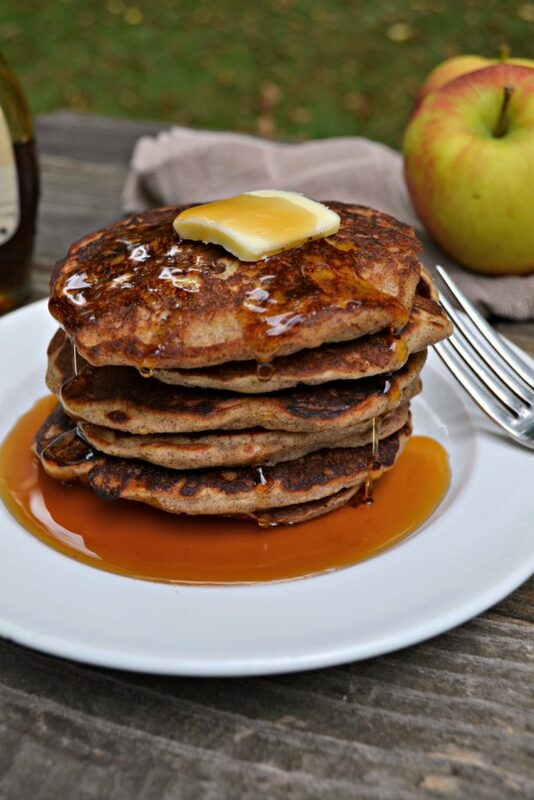 A fun fall breakfast, these apple pancakes are a healthy way to start a cool fall day. They contain no refined sugar, so you can enjoy this fun fall treat with zero guilt! Dye some of the batter red and strategically cook your pancake so that it will actually look like a apple as well! These fun cinnamon apple pancakes are going to be on your morning menu all season long – bonus, they freeze really well! There is nothing that screams fall more to me than going apple picking. To be fair, it’s not something I did with my family growing up a ton, maybe once or twice, but it is something that Alex and I have made a tradition since we started dating. Traipsing through a cool orchard in flannel and boots, (I’m pretty sure that’s the required uniform and they won’t let you in otherwise.) smelling fresh autumn air tinged with the smell of the apples that fell early fermenting, trying to find a tree that no one has gone over with a fine toothed comb, grabbing a cup of cider and a fresh made apple cider donut – it’s a magical experience. But the absolute best part about apple picking (okay, second, because seriously- freshly made apple cider donuts can be bested by very little in this world) is the bounty you bring home. If you’re like me, you probably go over board and get WAY too many apple. And while I will stick to it and say that I think a just picked apple is 1000000x better than the ones at the store that can be up to a year old, (look it up!) cooking with them is where it’s at, my friends. It’s no secret that I am a little pumpkin obsessed. I’m what you might call a ~basic~ chick. (They still say that, right? Having kids really takes you out of the cool loop pretty quickly.) Come mid-August I start jonesing for all things pumpkin and the second I can, order nothing without pumpkin syrup. Yeah, I’m that girl. So sue me. But just because I’m a die-hard pumpkin lover doesn’t mean that I don’t also crave alllll of the apple-y baked goods. One of these days I need to share the stupid easy recipe I use for when I make galettes (seriously, it’s just lazy pie) because it’s out of this world. When cooked, apples caramelize and add a fresh sweetness to everything the touch. In a recipe like, say, apple cinnamon pancakes, they add a touch of that sweetness without going overboard. I feel like fall is the perfect time to start enjoying lazy Sunday mornings – waking up slow, watching cartoons, and making a towering stack of pancakes – like these apple cinnamon pancakes. After a summer of early mornings and go-go-go-ing to do alllll of the fun things before it’s back to school, a slow Sunday morning is necessary. We have the Sunday morning tradition of making pancakes every week, but come fall our beloved buttermilk blueberry get swapped out our for apple pancakes. These are such a win- full of cinnamon-y goodness, lots of grated apple, and no refined sugar. It’s the perfect pancake to share as a family. If you know me, you probably know my love for sneaking fruits and veggies into everything my kids eat. These are no different – grated apple is what makes these apple cinnamon pancakes so delicious, adding fresh apple taste with little effort. I peel ours and use a box grater on the flesh, but if it’s a particularly thin skinned apple you would be fine to just wash the apple and grate it. We all know that I love making kid food a little more exciting, so I tried my hand at making a fun apple pancake out of apple pancakes. Just dye some batter red and pour a big red circle. Add about a tablespoon of undyed batter to the center and cook normally. Mini chips create seeds and you could easily use a pretzel stick to make a stem – I just grabbed a small stick from outside because we were totally out of pretzels. Obviously, I removed the stick right after serving it to Ryan. Substitute the milk and vinegar combo for buttermilk. It is definitely easier and tastier, but we rarely keep buttermilk stocked on hand, so I usually end up doing milk/vinegar. Any apple is great for this! Just use a large size on your box grater. You can also toss the apple chucks into your food processor and grate them that way. Use the juice that comes from the apples as well. I usually grate the apple directly into the bowl – less dishes and you don’t lose the liquid. Feel free to use whole wheat flour – you may need to add a but more liquid if using. Want to get your kids involved? 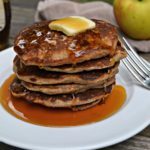 Apple cinnamon pancakes are a great recipe to make with your kids to continue your fall traditions. 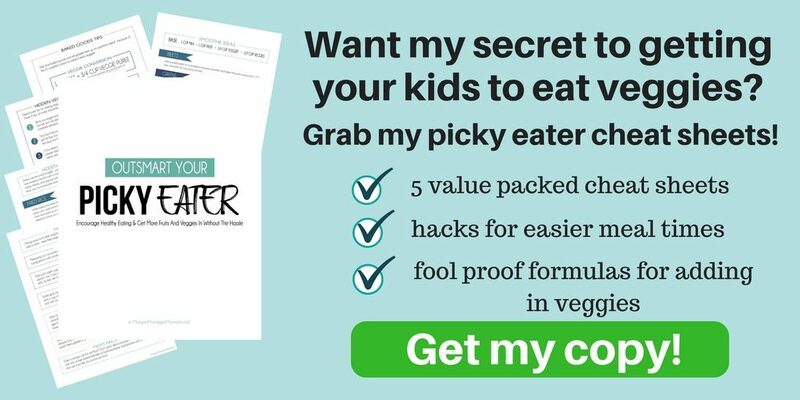 Some kid friendly tasks will be helping you to measure and dump the ingredients, stir everything together, or grate the apple if using a food processor. (they can just press the button!) This is also a great way to teach about reactions of vinegar to milk! Replace some of the apple with grated zucchini or yellow squash. 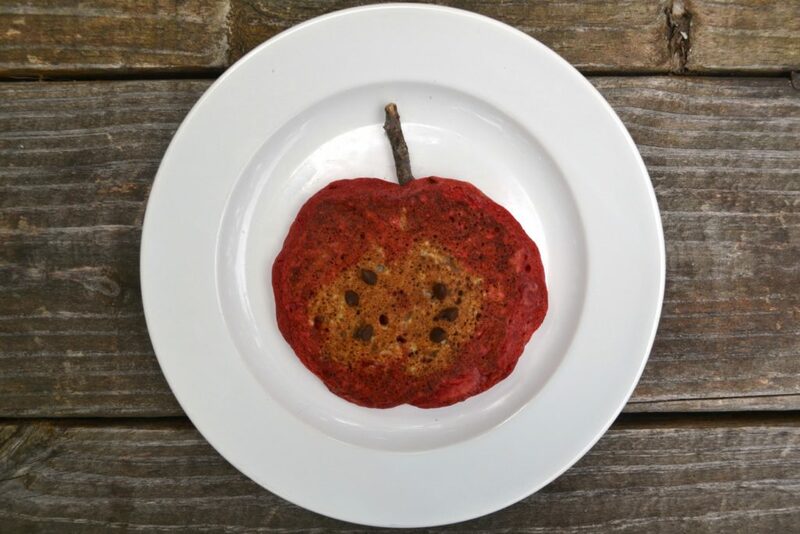 Since your kids are expecting the extra texture to some extent and there is so much flavor in the apple pancakes, they’ll never know, but you’ll love knowing you’re serving healthy pancakes. Packed with freshly grated apples and a healthy dose of cinnamon, these Apple Cinnamon pancakes will be a win with the whole family. Add in milk until the juice and milk mixture makes 3/4 cup. Stir in vinegar and allow to curdle for at least 5 minutes before adding in the butter, honey, and egg and stirring. Fold the wet mixture into the dry mixture until no more dry spots are seen. The batter will be lumpy, do not over mix. Heat a greased pan and pour about 1/4 cup of batter into the pan. Cook about 2-3 minutes until bubbles form in the center of the pancake and flip. Cook another 2-3 minutes. Enjoy! So tell me – do lazy mornings make you think of pancakes? Are you team apple or team pumpkin? Let me know in the comments! 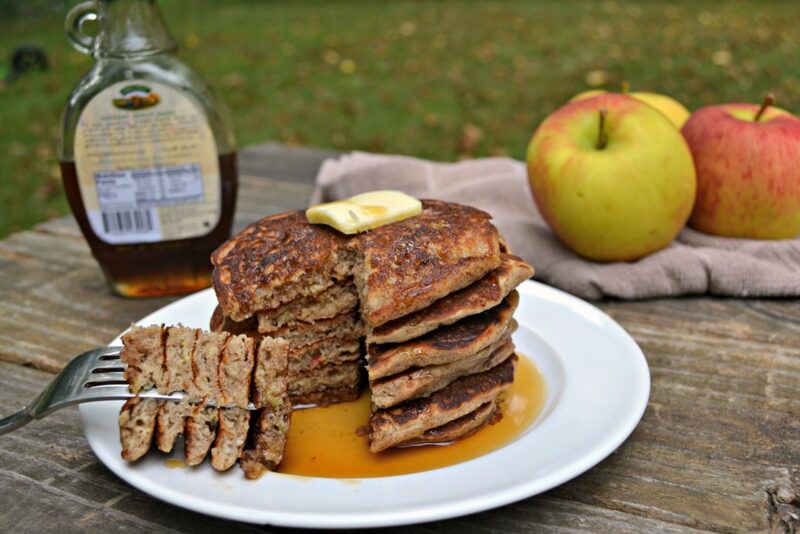 If you liked these apple cinnamon pancakes you may also like..
Yum! I could go with either but pumpkin is my favorite! Apple cinnamon pancakes sounds so tasty! Why hello fall! These look soooooooo good – and they’d make your house smell incredible too! Yes! They smelled like FALLLLL! They’re worth the wait, trust me! I don’t even know what to say right now… but that I want some of that in front of me now. haha. It looks so delicious. Lets see if I can make it look just as good.. 🙂 Thanks so much for sharing at the #happynowlinkup ! They’re so easy, too! Just grate an apple and you’re on your way! YUMMY! Thanks so much for sharing with us on the Homesteader hop! Yum! I love apples in the fall. Pumpkin is great, but I think I’m definitely team apple. There’s nothing like munching on a crisp sweet apple when you get a craving. I may just have to get over my fear of making pancakes (I always burn them….always) and try this recipe out. 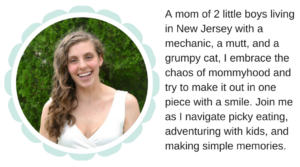 Thanks for sharing at the #happynowlinkup! We eat way more apple than pumpkin and these pancakes would be a great treat. I think maybe even picky my granddaughter would eat them. Thanks for joining us this week at Celebrate Your Story and sharing your links. I’m a big fan of both, but you can’t go wrong with apples!! These are great for kiddos since there’s no sugar other than the maple syrup! I love mornings where I have the time to make a good breakfast, which is almost always pancakes. I’m probably more team pumpkin than apple, but I do love them both! Right? it’s rare with the boys, but when I do I feel like the morning starts off on a good foot! Delicious and very nice, thanks for sharing with Hearth and soul blog hop, pinning and tweeting.